Maura Smale, information literacy librarian at the New York City College of Technology, suggests that librarians "embrace research involving human subjects" and seek IRB approval to do so. Smale notes that librarians can interact with IRBs in two ways. First, they can serve as IRB members or consultants, helping researchers and reviewers inform themselves about a proposal. Better library research, she suggests, could have prevented the 2001 death of Ellen Roche, a volunteer in a Johns Hopkins University asthma study. Smale could also have mentioned that better library research might prevent unreasonable IRB demands. Smale does note that approval took five months, leading the skeptic to ask whether the same deep thinking could have been achieved in less time by another form of review. "There are three levels of IRB review—exempt, expedited, and full. The IRB evaluates each research project and determines the level of review required; researchers may not make this determination on their own." (312) Exempt means exempt; it is not a level of IRB review. The regulations do not forbid researchers from making the exempt determination. And not even OHRP's recommendations insist that an IRB be involved in that determination. "Certain types of studies automatically meet the criteria for exemption set forth in the Common Rule, including research on 'normal educational practices' such as curriculum design, instruction, and assessment. Research involving use of previously collected data is also usually exempt. In both cases the subjects' anonymity must be preserved." (313) The "normal educational practices" exemption, 45 CFR 46.101(b)(1), imposes no requirement of anonymity. The existing data exemption, 45 CFR 46.101(b)(4), does not require anonymity if the data are publicly available. 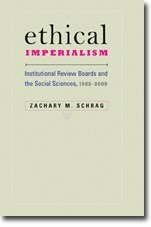 "It is worth noting that the underlying principles used by the IRB to evaluate projects involve ethical treatment of subjects and preservation of privacy and are similar to the recommendations of many discipline-specific professional organizations, including the Oral History Association and the American Anthropological Association." (316). For over a decade, the Oral History Association has been fighting IRB requirements and insisting on the differences between the ethics of medical research and the ethics of oral history. Smale does cite the CITI Program in support of this assertion, but she fails to notice that the CITI Program offers no support for its statement. I am grateful to Smale for sharing her experience and for her kind citations to this blog and to my scholarship. But I fear that she has too readily accepted the claims of IRB administrators and training programs, leading her to advise librarians to tolerate months of delay when they should be demanding swift exemption. Thanks for reviewing my article, Zachary. I enjoyed your article in the Journal of Policy History and look forward to reading your book. * My understanding from the training I attended is that the definition of research is essentially the same in the Belmont Rule and the Common Rule. Thanks for the clarification. * I agree that level is a poor word choice--my intention was to convey that once an application is submitted to the IRB there are usually three outcomes, which I believe is still clear. At my university researchers are not permitted to determine whether their study meets the criteria for exemption. * Another case in which my institution's requirements differ from the Common Rule. * You're right that this is the practice at my university. From what I've read about librarian researchers' experiences at other institutions (which is admittedly limited--there's not much published), it's the practice as well. My IRB's comments about these projects centered on whether revelations about students' academic behaviors/performance could impact their reputation/employability. * I know that oral historians (and anthropologists) have been protesting IRB requirements, but I thought it was worthwhile to point out that protection of research subjects is important to both researchers and the IRB. I'm not sure I understand the relevance of the CITI Program here -- in the citation for this sentence I include the AAA's Code of Ethics and an article by Rachel Vagts, an archivist, in which she discusses the OHA (the OHA Evaluation Guide's Principles and Standards offers similar information). You are correct that my primary goal for the article was to introduce the IRB process to librarian researchers, many of whom (especially junior faculty) are new to human subjects research and are likely not familiar with the IRB. I completely agree that the IRB process is flawed for much research in the behavioral and social sciences as well as unnecessarily lengthy. (Believe me, those 5 months stretched on.) But that discussion didn't fit within the scope of my article, so I included only a brief introduction to the topic in the endnote. Fear of the complexity of IRB regulations has led librarian researchers I know to simply avoid any research involving library users. I felt that a lengthy catalog of problems with IRB approval in the social sciences and humanities would discourage human subjects research in libraries. I would rather encourage librarians to undertake these kinds of projects. Once engaged, I suspect that many librarian researchers will become interested in working for change in the IRB process (as you note re: the ALA resolution proposed recently). Thank you for these comments. I think it important to distinguish between the provisions of 45 CFR 46 and the additional requirements imposed by your institution. Not all academic librarians will face a regime as burdensome as yours. And even those who do will need to decide whether to accept or challenge the strictures on their research. They deserve the most precise information possible. As for oral history, I am afraid I misread footnote reference 39 as 30, leading me to misunderstand the source of your claim. That said, I don't think the brief mention of oral history does justice either to the Vagts article or to the broader debate about IRBs and oral history. Moreover, the 2000 OHA Evaluation Guidelines you cite in your comment are no longer in effect. In 2009, the OHA replaced them with its Principles and Best Practices. By removing the language about exploitation, the new document further distanced the OHA from the medical ethics of the Belmont Report. I would be interested to learn more about your own research, whether you agree that students faced a realistic risk of unemployability as a result of discussing their use of the library, and why it took the IRB five months to find a way to mitigate that risk. I applaud your wish to encourage research by librarians. But I don't think that goal is best served either by understating the difficulties they will face or overstating the legal or empirical bases of IRB power. The main reason that it took so long for the project to go through review is that the IRB requested that I submit a complete list of interview and survey questions that I planned to use in my study, so there was one set of revisions during the process. My current research includes interviews with students to discuss their scholarly habits, how they complete coursework and their study strategies. It's difficult to say whether the details that students discussed with me during their interviews could have a negative impact on them during their college careers or on their future employability. I learned about the courses they took and they ways they prepared (or didn't) for their assignments, in addition to their library use (or non-use). That knowledge might affect the way those students are perceived by faculty or employers if they were able to identify individual students. In this case it didn't feel particularly onerous to obtain informed consent and to protect students' anonymity. Thank you for this comment. I would suggest that demanding "a complete list of interview and survey questions" in advance is a particularly inefficient form of human subjects protections. A better system would have let you proceed with your research, and then reviewed your manuscript prior to publication to see if it contained anything hazardous to the participants. See Carole Gaar Johnson, "Risks in the Publication of Fieldwork," in Joan E. Sieber, ed., The Ethics of Social Research: Fieldwork, Regulation, and Publication (New York: Springer-Verlag, 1982), 87. Such a system could have reduced the time of review from months to hours. Thanks for recommending the Johnson article, Zachary, I'll take a look.